This earring pair has a deep red Swarovski crystal bead and sterling silver accents. The wires are handshaped sterling silver wire. The drop is about 1 inch long. 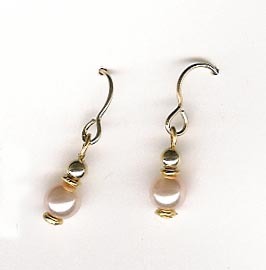 Handshaped gold plated wires support a delicate drop of pink glass pearls and gold plated beads. These Agate chip and Copper Wrapped glass earrings go well with the Agate Chip bracelet shown above. The wires are hand formed of sterling silver wire.